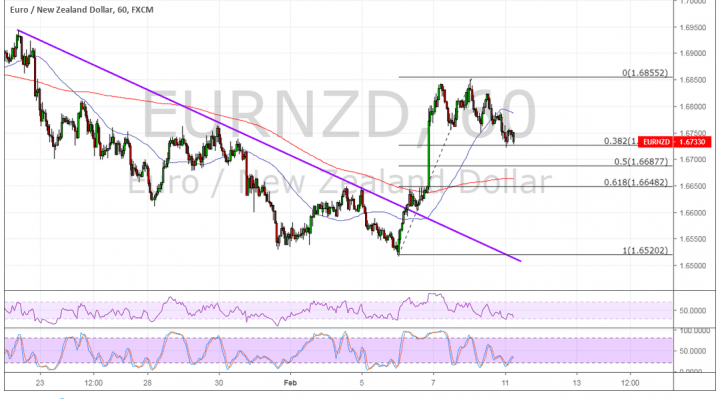 EURNZD recently broke above its descending trend line to signal that a reversal from the downtrend is taking place. However, price hit resistance around the 1.6850 minor psychological mark and may be due for a pullback. Applying the Fibonacci retracement tool on the latest swing low and high shows that the 61.8% level lines up with the 1.6650 minor psychological mark and the 200 SMA dynamic inflection point. This is also in line with an area of interest that could keep losses in check. If so, EURNZD could resume the climb to the swing high and beyond. The 100 SMA is above the longer-term 200 SMA to indicate that the path of least resistance is to the upside or that the rally is more likely to resume than to reverse. The gap between the moving averages is also widening to reflect stronger bullish momentum. RSI is heading lower, though, so there’s some selling pressure left. This oscillator is approaching oversold levels to signal exhaustion and a potential takeover by buyers. Stochastic is already in the oversold region to show that buyers are ready to take control. In that case, another test of the swing high could be in the works. The euro is being bogged down by downbeat data, particularly coming from the region’s top economy, Germany. Retail sales came in much weaker than expected and factory orders also missed expectations, indicating that consumers and businesses are slowing their activity. This underscores downbeat ECB estimates and their bias for keeping rates on hold for much longer. Meanwhile, the RBNZ will have its say this week and traders can have a better idea of whether or not this central bank is more dovish. Recall that the RBA signaled scope for cutting due to trade issues, so the RBNZ might have the same view.